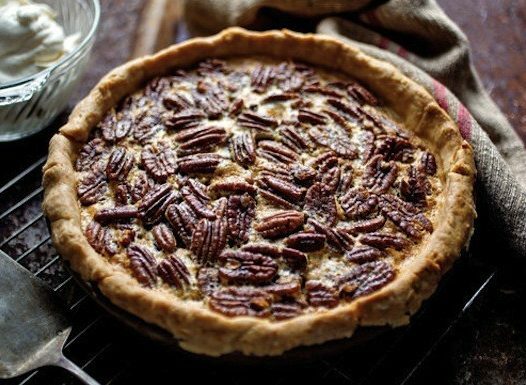 Traditional Pecan Pie with a filling of eggs, pecans, butter, and sugar, topped with honey-glazed pecans. Here is an easy dessert recipe for Honey Pecan Pie, a perfect way to end your meals this holiday season. Combine eggs, pecans, corn syrup, sugars, butter, vanilla, and salt in a large bowl and stir until combined. Pour mixture into pastry shell. Bake at 350° for 30 minutes. In a small saucepan, melt butter over medium heat. Stir in brown sugar and honey until combined. Stir in pecan halves until coated. Spoon over pie. Bake for another 15-20 minutes or until a knife inserted in the center comes out clean. Cool completely on a wire rack. Makes 8 servings. Refrigerate leftovers.